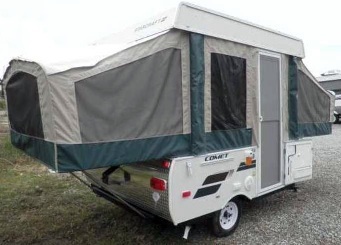 Used pop-up tent trailers are relatively inexpensive type of RV and are ideal option for families or couples who search for the minimum-cost RV. They are very easily stored and most of them can be towed by any size smaller car or downsized SUV, minivan or truck, pop-up tent trailers are highly popular among active families. Furthermore, they offer plenty of sleeping space as most models have a pair of double beds. If you add the fact that the included dinette may be converted into a double bed in most models meaning that there's a space for up to 8 people to sleep, it makes them very specious type of camper. - Viking boasts stunning appeal and lots of features which provide very practical and comfort features. It includes slide-out dinette, kitchen including sink, oven, fridge, hot water heater, shower, toilet, sleeping area. Thanks to these amenities, Viking is a family-friendly tent trailer which is very easy to set-up, store and easy to use. - Forest River Palomino is designed for active families, furnished for comfort and fun fitting all camping need providing great experience for years. It is equipped with all the usual amenities you need while on vacation giving you the feeling like being at home. It features kitchen faucet, running water, heater, fridge, stove, sleeping area. Being light-weight it can easily be towed with most vehicles. - Jayco is lightweight unit which sidewalls are collapsible made of hard wall construction and canvas. When set up this type of tent trailer feature kitchen, dining, bathroom and sleeping facilities. It is one of the most popular and affordable camping trailer as it offers family-friendly choices in furniture configuration. It is made of high quality materials providing usage for a long time. - Starcraft is maybe one of the most dependable brands in the camping industry. It is great trailer with handful features. It comes with slide-out dinette, storage cabinets, hot water heater, shower, stove, and fridge. Some models offer plenty of space for preparing meals. Being lightweight it can be towed by most family vehicles. - Rockwood tent trailer is neatly packaged into extremely functional unit. It comes with many amenities such as stove, heater, refrigerator, two double beds, slide out dinette. This means that sleeping capacity is 6+ people. It is easy to set up, easy to clean and maintain due to high quality materials that is made of. Some models come with heated mattress so you can stay warm at night. Rockwood is light-weight tent trailer so it is easy to tow. While I was camping in Arizona one year, I found a used pop up tent trailer that was very nice and affordable. It had all the accessories already included, which presented a nice little camper. The people who brought it thought it was so nice that they decided to take a trip to AR for a camping trip. They had a van for towing it and just loaded up the family and took off. I've seen them the following year and they still had the used pop up tent trailer, but they had brought a truck and were very happy with their experiences that they were having. They have recently bought a 4 wheeler and take it along with them. The tent pop up camper is nice for traveling to all areas and the best part is when you sit down at night by the fire and tell stories with friends. The used pop up tent trailer has enough room for the entire family and everybody has a place to sleep. The kids enjoy bike riding on a 2 wheeler as well as adults. All used pop up tent trailers are easy to care for and you do not have many problems with them at all. If you get a chance to buy a tent pop up camper, you should really consider buying one. Used pop up tent trailer campers are just as nice as a new camper. 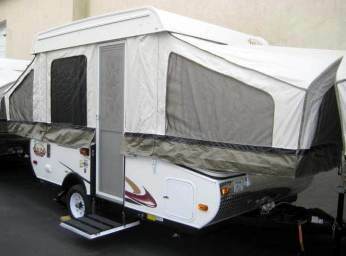 When you buy a camper, you will want to inspect the canvas, interior, exterior and this includes the tires. Most people keep there campers in good living condition, so you should be able to find a used pop up tent trailer that is very nice. Adding a storage carrier and bike rack is easy enough to do if it does not already have one.